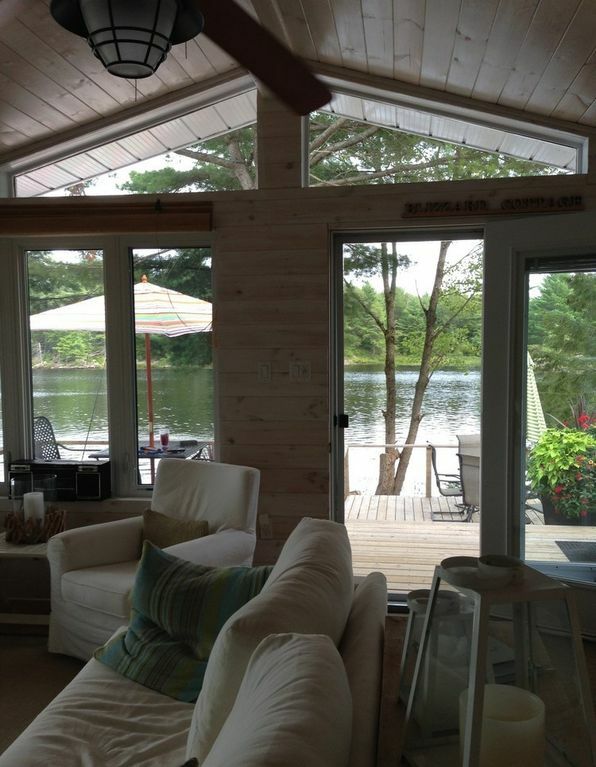 Newly renovated 3 bedroom cottage has 310 ft. water frontage. Located minutes from Bala and a few more minutes from Gravenhurst - 1 3/4 hrs from Toronto. Clean, private and quiet. Great views of the lake from cottage and deck. An aluminum boat with motor and 4 adult life jackets is included. Gas fill up available at marina. Children's life jackets are not provided. Please provide if you have children. Paddle boat/canoe/kayak available at the cottage for your use. The cottage is a 6 min. boat ride from the marina. Must have your Ontario Boating License. Parking available for your vehicle at the Marina in either our spot or on the government parking side. A Weber BBQ is available and a filled propane tank is included. There is a large outdoor patio set for outdoor eating and many other seating areas to choose from. The living room, kitchen and dining area is open concept with a new wood burning stove. The cottage is fully insulated and the indoor bathroom has been recently renovated with a new shower, toilet and sink. The cottage can sleep 6 guests and there is a maximum 6 person occupancy. Bed linens and shower towels will be provided. Pillows, duvets/comforters on each bed. Kitchen is also fully equipped. Minimum of 7 nights (Sunday-Sunday) rental is required during peak season (July/August/September). A Booking Agreement to be completed. Refundable Damage Deposit ($500) required with booking. Refundable after rental inspection. 50% payment will be required upon the acceptance of your booking and final balance 7 days before rental. Swimming is mainly from end of dock. Dock ladder for in/out access. Water is deep at end of dock and warm in the summer. Water is very calm and we are in a bay with quiet lake activity. The property was very clean and has everything you need to enjoy a family vacation. Lots to do including; swimming, fishing, canoeing, kayaking and boating. Lake is quiet and calm. We can’t wait to go back next year!